Challenge/Response is an anti-spam plugin for Adium 1.3+. It works by hiding messages until the user answers a question you have picked. For example, "What is the square root of 49 in numerical form?" must be responded to with "7". When the user responds correctly, all of the messages that were hidden are displayed as though C/R never did anything, and the user is added to the C/R whitelist so that they will never be asked again. Since you set the challenge and response, the spam bots won't know what to say. You can find the C/R preferences in the Adium menu, under Privacy Settings. You must enable C/R and set the challenge and response before it will do anything. If you disable C/R, it will display all the saved messages from users who have not yet answered the question while Adium has been running. 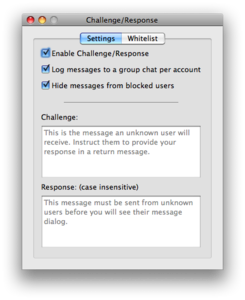 You can optionally log all messages which were hidden by C/R to a group chat called ChallengeResponse (one is created per account, a limitation imposed by the logger plugin currently). You can also hide all messages from blocked users, for protocols like MSN where blocked users can still message you. The source is available from the Adium Mercurial repository at http://hg.adium.im/plugins/challengeresponse/. Hide authorization events until after a C/R. With MSN, you will sometimes see the "switchboard error" message displayed in the chat window. This is caused by the bot not properly responding to received messages. A future version will prevent their display. This does not interact well with "Open chats when typing begins" (psychic option in Advanced>Status) as it will open a chat and auto-whitelist the user. This may not be a problem for spam, depending on if the spammers send typing notifications. Fixed adding to whitelist when the whitelist is empty. Logging of messages to an imaginary group chat, for quick review of possible missed messages. Add users to the whitelist from the Whitelist preferences. Hide messages from blocked users. Wow. If only I had spam bots IMing me all the time this would be awesome. Alas I don't. I've added this to the TODO list. Plus button on the whitelist tab doesn't seem to work. Strange. I've uploaded a new build (with no changes…) that fixes this. Must have been a weird build. Strange, but it still doesn't work. Is there any way to get some sort of debugging output? Open /Applications/Utilities/Console.app, it should be logging there. Oh, *facepalm* I see why. If your whitelist has no entries, it won't be able to do the add. I'll fix this sometime today and upload a new copy. For now, you can add without problems as long as your whitelist has at least one entry. I've posted an updated build which fixes this. Looks to be working ok now. Thanks! The problem seems to have reoccurred with Adium 1.4b17. The + button yields an entry labelled "(placeholder)", but as soon as I edit the text or try to change the protocol, it disappears again. Mac OS X 10.5.7, Adium 1.3.4, I can't add any contacts to the Whitelist with the plus sign button. An AIM logo and (placeholder) appears, but when i go to change it, the entry disappears. Also, should be an option to automatically add all contacts in my contact list. $ svn co svn://svn.adiumx.com/svn/adium/plugi...ngeresponse . Whoops, sorry, that /svn is extra. svn://svn.adiumx.com/adium/plugins/c...ngeresponse should work. whitelist clears when trying to add someone, even when there is at least 1 entry already in it. The Whitelist didn't work (I can't add entries), and I receive always spam (But I don't receive the bot message. I have this in a bot spam chat window : "Impossible to send message. A standardist server error". Hi Zac -- excellent idea, but I've found a slight flaw. :) Most of the MSN spam I get involves a bot sending me a message and immediately signing off again -- so when the plug-in tries to send the challenge, the message bounces, and a window opens with the error "Could not send message...". I think that, if possible, it would be sensible to keep that message window from opening. Is that possible? Yes, though it might take some additional hacking. I don't think the "Can not send..." messages are content objects, so it might be difficult to hook into and prevent it from displaying. I'll check it out. That's how I fixed my big MSN spam issue. Is it possible to enable this for specific people ON my contact list? I've got a math-loving friend who would probably get a kick out of having to solve a math problem to IM me. I actually think turning this on for specific people also helps if you know one of your buddies are infected with virus that randomly sends spam, or the account is hacked and it randomly sends spam. So, their message is only displayed if and only if they respond to the challenge. I don't usually get random spam, but it's more of a few buddies that isn't aware they're infected. I hope I'm allowed to make this changes. A patch is ready if you want to merge this into your SVN-Repository. Just contact me. After I updated to Adium 1.3.3, I was prompted to disable challenge/response. I did but now I can't figure out how to re-enable it. THANK YOU- I've been getting a *lot* of AIM spam lately and am incredibly glad to have found this. Is there any place for a simple text filter to be added to this plugin? It may fall outside your set of planned features, but rather than a challenge/response, I'd much rather filter incoming messages from people not on my contact list for content. MSN spam is generally repetitive for about a week, and I wouldn't mind managing the filters by hand. Any word on MSN's switchboard error?? I was wondering if it was possible to make a setting where you can exclude certain services. For example: I really need this plugin on MSN, but I don't like it on Facebook chat. vll etwas mehr einstellmöglichkeiten, aber trotzdme topp! Like others mentioned in earlier versions, the version I downloaded today, 4/1/10, does not allow me to enter names in the whitelist. When I type a name in, the list clears, as mentioned above. I am on a Mac running 10.5.8. Has this not been solved? Or am I missing the information that would allow me to add names to the WL? Hey there! Please do implement this filter for authorization requests as well, 99% of the SPAM I get is through authorization requests (and from ICQ, like for most others apparently). I wish I could just cancel my ICQ account, but that's no option for me as most of my contacts use ICQ. On the whole, this looks great! Thanks much. Oh, and yes I know I could rewrite the question to make it have only one specific answer. That was just an example. I'm just trying to make it easier for people while making it harder for bots. I now get the error "This plugin does not support your native architecture", with the option to disable it. Which probably means this plugin never worked on Intel when not forcing Adium to run under Rosetta. this plugin no longer be supported?